A real Mediterranean jewel, Poreč has kept the allure of a small coastal town, but still possesses all the characteristics and facilities of a tourist centre, which will make your holiday all the more interesting and comfortable. You will discover classical music and jazz concerts, folklore festivals, street art festivals, museums and galleries as well as a number of shops and restaurants. Many different nations and cultures have been woven into Poreč’s turbulent history; this valuable cultural heritage is visible at every step. If you set out on the streets of Cardo Maximus or Decumanus you will be walking the same streets where the Romans once walked. Almost two thousand years have passed since Poreč became Colonia Iulia Parentium and got the status of a town. In 1861, at the time of the Austro-Hungarian monarchy, it was declared the headquarters of the Istrian parliament. It is worth visiting the ruins of the Roman shrine with temples, medieval forts, Romanesque, Gothic and Baroque palaces. A special place belongs to the Euphrasian Basilica, dating back to the 6th century, decorated with the renowned Byzantine mosaics, under UNESCO protection. Come and find out why the Roman patriarchs built their luxurious villas here to celebrate the beauty of life. Poreč’s richness is measured by its historical heritage, deeply rooted in this area for thousands of years. The priceless city centre, located on a small peninsula submerged in the sea. Its foundations were put in place during the time of the rule of the Roman Empire. From then until now the symmetrical geometric layout of the streets has been preserved, the along the length of Decumanus and transverse Cardo Street. The priceless Euphrasian Basilica, was built in the 6th century and its value has been recognised by UNESCO, the protector of the world’s heritage who in 1997 took this location under its wing. Within the sometime Poreč city walls, near the oldest square, Marafor, the fragments of ancient temples are thoughtfully cared for. The rich treasury of old-city monuments belongs to the Romanic House dating from the 13th century, the House of Two Saints dating from the 15th century and the baroque interior of the Istrian Parliament. As it grew outside the city walls, medieval churches sprung up in the city and the church Lady of Angels, built in the 18th century, rises on Trg Slobode (Freedom Square). Bestowed with natural beauty, clean air and sea whose quality has been regularly measured and monitored for the past 30 years, you can relax and enjoy Istria’s sea and hinterland. A public institution for the protection, maintenance and promotion of the origin and authenticity of nature, Natura Histrica, is active in the area of the Region of Istria. In the Poreč area we find valued nature sites such as two geomorphologic nature monuments, the Baredine Caves and Mark’s Cave, a zoological nature monument at Pinzin’s Cave and a botanical nature monument made up of a group of trees around St. Anne’s Church near Červar. Every household in Istria has since ancient times prepared maneštra, a thick boiled soup made of various vegetables with the addition of cured meat. Traditional pasta such as fuži, njoki, pljukanci or pasutice, are served with a gravy-like sauce made of chicken, beef or wild game known as žgvacet. Traditionally cured ham or Istrian pršut was once served only at special occasions, while fritaje, egg omelettes with wild radicchio or asparagus were eaten all year. First-class meat specialties other than pršut are ombolo (boneless pork loin) and kobasice (sausages) which can be eaten raw or grilled. Poreč’s restaurants and taverns prepare potatoes pod čripnjom (baked on a hearth by covering with a bell-shaped metal lid and then covering the lid with embers) and serve them as a side dish to meat specialties. Other than these, you can also taste seafood specialties. Depending on the season, on hot summer days Poreč’s restaurants offer fresh and delicious European seabass, gilthead seabream, grooper, sardines and numerous shellfish. It is important to note that flat oysters are eaten raw, while Mediterranean mussels are eaten steam-cooked in their own juices with herbs and wine. 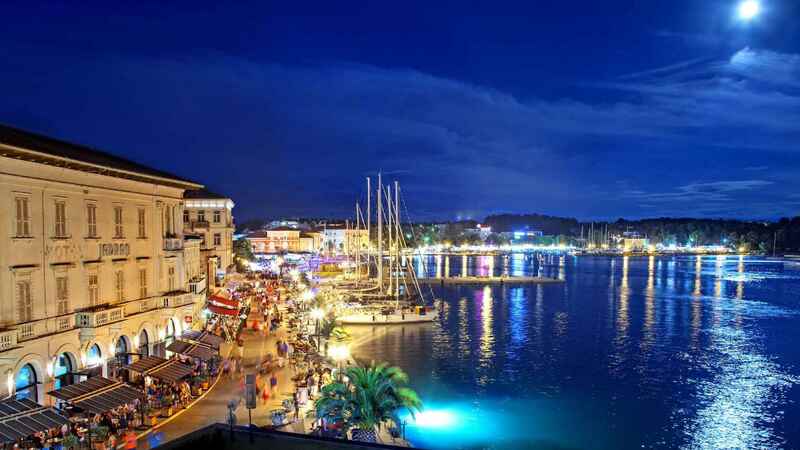 Discover restaurants and taverns in Poreč that will satisfy all your senses. The affluence of the Istrian peninsula is based on olive oil production, a tradition that is over two thousand years old. The olive, a symbol of peace and health, is considered by many to be a valuable Mediterranean fruit and its oil has been called liquid gold by those who live in areas where it is cultivated. The fruit of the olive tree, the stone, gives some of the healthiest drops of oil. Although olive oil production is divided into various categories of quality, among the healthiest oils are precisely extra virgin olive oils, rich in vitamins, natural antioxidants and carotene. Olive oil roads lead you directly from the sea to olive groves, oil mills and cellars. They include the olive-growing areas of the hinterland surrounding Poreč with its idyllic roads, paths and trails. Grape vines have been cultivated all over Istria and as such in the area of Poreč since the time before Christ. Thanks to its fertile soil and mild Mediterranean climate with long, hot summers and short, mild winters, Istria has the ideal conditions for the development of grape cultivation. The wine roads will enchant you with their natural beauty and all the colours, scents and tastes will guide you to new explorations. All our accommodation facilities are situated in the magical blue-green Mediterranean, in the well-tended surroundings in the immediate vicinity of the sea and not far from downtown Poreč which can be reached on foot, by bike, bus, tourist train or boat. You can choose between 12 hotels, 4 apartment villages and 4 campsites. Each is unique in its own way, offering their visitors an extraordinary experience.